Millennials offer many unique coaching challenges! Badly executed “Positive Reinforcement” may be one of the biggest mistakes most coaches make when coaching this generation. The importance of recognizing excellence vs. positive reinforcement is an important coaching concept that I feel many coaches and parents miss when developing great volleyball players and people of character who will thrive in the world today. Looking at this current generation we coach, I think it is imperative to confront some difficult truths, and I feel this video by Simon Sinek called the “IQ Millennial Question,” sums up some of the challenges we face as parents and coaches. Kids being told they are special. Kids getting rewarded for things they do not deserve. Kids getting false expectations of how the real world works. Much of this stems from a belief in the value of positive reinforcement. Parents and coaches have been told and programmed to constantly reward children, often for mediocre or poor performances. It begs the questions: Why is there a false belief in positive re-enforcement? Why are the benefits of positive reinforcement constantly touted? So, how does it fail? And why have we created a generation of people with so many challenges and struggles in the workplace and life? Coaches have become like kindergarten parents. You know the one, where your kid makes you an objectively terrible papier-mâché statue, running home, excited to show it off and you tell them it’s the greatest statue ever created. You praise them as if it’s “The David.” Meanwhile, dad comes home, does not get the memo and tosses it in the trash because he thinks it’s literally garbage. Coaches and parents need to suffer from more B.H. “I just want to warn all of you that I have a really bad problem. I suffer from something called B.H. Now you guys all know what B.S. is, correct? It’s not that. Do you guys know what B.O. is? It’s not that, either. No B.H. (Pause) – Brutal Honesty! What does this mean? If you don’t play well, I am going to tell you. If you lazy and don’t work I am going to tell you. But more importantly, if you do something good, particularly if you do something great or excellent, I am going to tell you the “Brutal Honest” truth!” ? We offer “Positive Re-enforcement” too easily and quickly. This brings us up to the other language we use as part of the Volleyball1on1 Culture on Whole Person Growth! “Over the course of a season, our job as coaches is to steer the team towards a ‘winning team culture,’ while establishing ‘what good looks like.’ The result is that players will develop confidence individually, which will then permeate onto the team as their behaviors and performances begin to match their self-ideal, which we as coaches establish. “At Volleyball1on1, we believe it is the job of the coach to craft an environment that is conducive to developing every player’s self-image. This includes teaching through drills and exercises aimed at building a ‘winning team culture’ and emphasizing ‘what great looks like,’ to helping players to perform specific behaviors and volleyball skills in a positive way. Equally important, these exercises will also stress the importance of recognizing excellence in behaviors relative to themselves and others, which produces a heightened level of trust on the team. “There is such an abundance of opportunities to recognize excellence: tell a teammate when they make a good dig or pass or set, support the overall culture of the team, be competitive while also remaining considerate to your teammates. 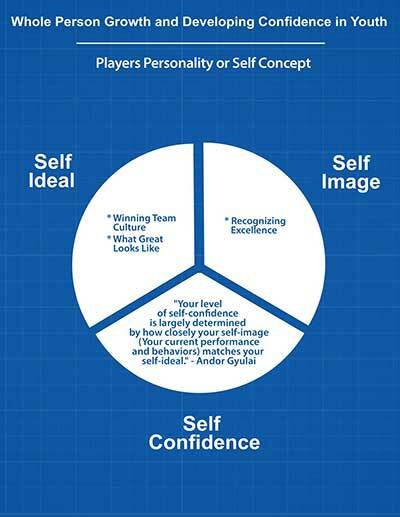 All can contribute successfully to improving a player’s self-image. However, to implement this culture of “Brutal Honesty” and “Recognizing Only Excellence,” it must be established from day one. This can be difficult to establish or as a coach, create a new habit. Schedule a call and I will be happy to share stories of how we have helped many programs and coaches overcome the challenges of working with this “Millennial Generation” successfully.